If you’ve ever needed to make sure that no one could get into a building until you can get the locks changed it can be a little hard to accomplish. As soon as that lock is changed you’re fine, but until then the residence is left unprotected. That’s bad news for landlords trying to boot out freeloading tennats. If you know you can’t get in to get a new lock immediately you could keep a stash of these Lock-Kills from DG3 Locksmithing. They’ll make sure that no one gets through that deadbolt. After someone has been evicted the property manager could then put in this key into any Kwikset lock and the end of the key will break off inside once you twist the key. That piece stays inside making it impossible to open the deadbolt. 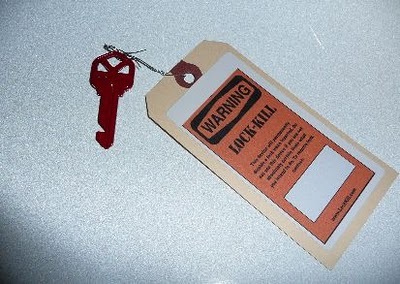 These are strictly meant for the use of locksmiths and property managers, but I’m sure that at least a few people will use them for mischief instead of practical reasons. You can purchase one of these patent pending keys for $19.95. I can see no good reasonn or practical use for this product!,other than abuse! LMFAO really? Why would you pay 19.00 dollars for this crap when you could just shove a paper clip in the lock, use super glue in the key hole or a million other things to jam the lock. First of all this is a good product for people that operate apartment buildings or rental units, such as duplexes. Super glue works, yes, but with a little fingernail polish remover it can be taken out with ease. Using a key extractor works, yes. I wouldn’t use a paper clip because it could damage the pins if it isn’t put in correctly. BUT the idea behind this is to disable the lock so a person can’t use their key to get in, such as a tenant that has been evicted and still has the key. Not all landlords have locksmiths on staff, so they have to wait for one to show up and change the locks. This product helps keep the average person out until it can be replaced. I will admit that the cost is a bit more than I thought it would be, but it’s not outrageous. I wouldn’t use a paper clip because it could damage the pins if it isn’t put in correctly. This product stays in the lock and the only way to get into the property at that point is to drill out the lock. The ad says that. So why worry about the pins if you are going to use another product that permanently disables the lock? I think this product is a good idea and hardly something I would pay 20 bucks for if I just wanted to screw up someone else’s lock as a prank. First of all, thank you for your reply. I’m sorry it took me so long to get back here. Secondly, an experienced locksmith could remove the product from the lock saving the need for drilling it out. Others had mentioned they they could remove it in some other ways (Super Glue for example)which is possible. I was simply answering the comment about the paper clip and the risk of damaging the pins if that is used. You can not “lock out free loading tenants” as it is against the law (at least in TX) unless I am willing to return to their home 24HRS per day to let them in (which I can’t do if the lock is disabled.) Also you spelled tenant wrong.